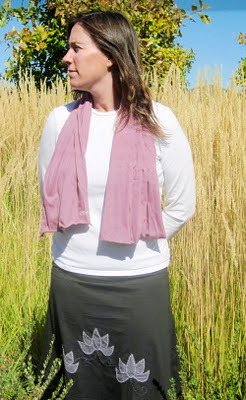 This next Free Spirit Spotlight introduces you to Suzy, creator and owner of Hip Mountain Mama. Many of you are probably already familiar with her as she has a wonderful presence on her blog in the world of Twitter. She sells natural products for mamas at her on-line store. I just ordered a Moby wrap from her and can’t wait to start using it with Ashton. 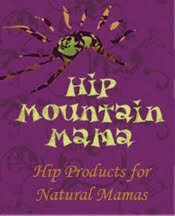 Enjoy her lovely interview, and leave a comment for your chance to win a $30 gift certificate to use at the Hip Mountain Mama shop! *Photos provided by Hip Mountain Mama. I guess I have always felt like a creative person. There are certain mediums that I am better at using than others, but as a whole I’m pretty creative. I think a lot of this comes from my mom always telling me how creative I am. She really boosts my confidence when it comes to my creativity and it has been important to have someone in my life to keep me feeling good about my creations. I honestly feel that we are all creative beings; we just need to recognize and embrace it. I really enjoy putting things together…making something beautiful from just a few materials. Things like jewelry, knitting, and basket weaving. I feel that when given a few materials and asked to create something, this really brings out ones personality and is such a wonderful freedom of self-expression. I get a lot of my inspiration from nature. I love creating things using natural materials or even things taken right out of nature. I also find tons of inspiration from other creative people through blogs, craft fairs or friends. Well, if you are literally talking about space…I usually find myself crafting on my bed, or couch, or the kitchen table with materials spread out all over. I don’t have a craft room or area of the house, so I keep most of my supplies in my closet or mixed in with the kids art supplies. As far as time goes, I usually create with the kids so I am basically killing two birds with one stone, right? I get to spend quality time with the kids while teaching them the importance of fostering their creative sides, while also getting to embrace my creativity at the same time! There are also times I find myself knitting in the waiting room of the dentist office, or in bed at night, or in the car on the way to Grandma’s house…I sneak it in when I can! 5) What is a free spirit to you and do you feel like one? ~having an open mind ~willingness to try new things ~not afraid to get messy ~lots of laughing and having fun ~exploring new places. To me, being a free spirit means having a blast, but also taking care of your loved ones and acting in a caring and responsible manor. 6) What would you say to those who want to live a creative, free spirited life but don’t feel very creative and don’t know where to begin? Like I said in the beginning, I completely believe that we are all creative beings. Think about it…when we are kids, we are all given crayons and glue and other materials and we know just what to do with them. There is some point in our lives when we stop playing with those materials and we seem to lose the desire to create. My advice is to start creating again! Pick up those crayons and doodle, paint, learn to knit, start a blog, or take guitar lessons. 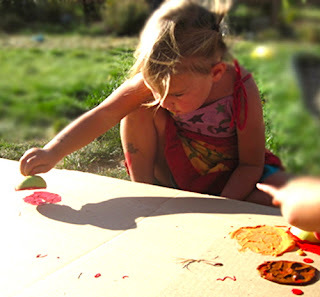 Don’t worry about the outcome or about getting messy – just have fun! BIG thanks to you, Suzy, for sharing your creative spirit with us. 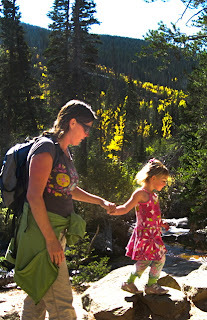 Your Personal Reflection: Do you carve out enough time in your day for your creativity? Leave a comment here for your chance to win a $30 gift card to be used at Hip Mountain Mama. Join my Facebook fan page if you want a double shot at winning. I’ll announce the winner later this week!